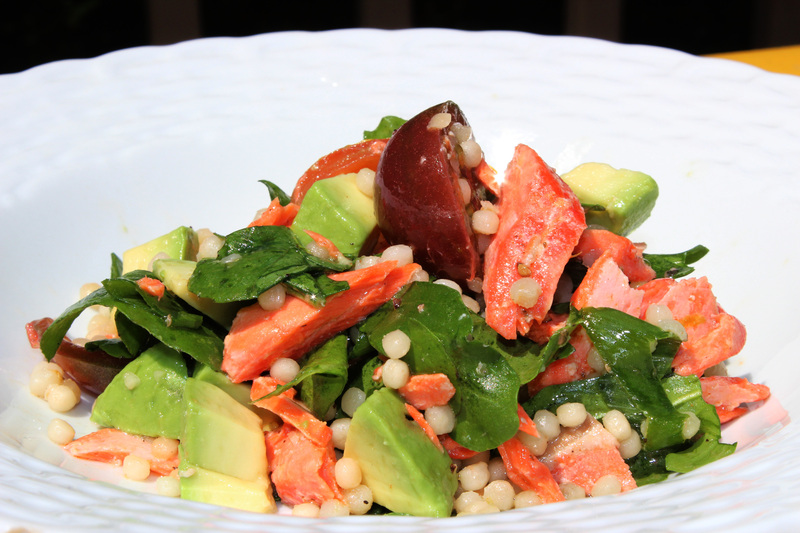 Labor Day weekend has arrived and this salad is an ode to the end of summer. Schools are back in session, nights are beginning to feel a bit more crisp, the humidity is starting to break. Labor Day also signifies that many fruits and vegetables are either at their peak of sweetness, like those cherry tomatoes you’ve watched ripen under the sun all summer long, or making their final round – i.e. green beans. Green beans are often one of the first summer vegetables we harvest and if planted just right, will continue to reproduce through August. 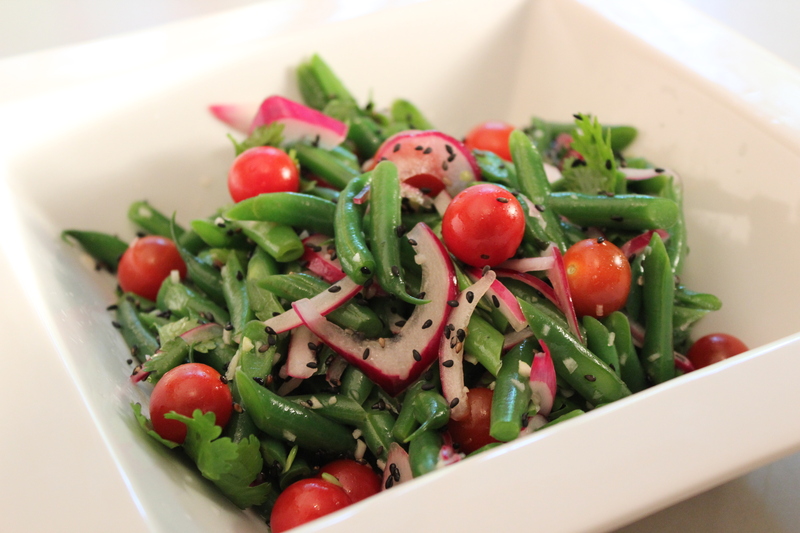 One of my favorite ways to prepare green beans is Asian style. Perhaps it’s a vestige of growing up in New York City and our Sunday night Chinese order-in ritual which always included dried sautéed string beans, or my love of green papaya salad, which often includes a few diced green beans and tomatoes doused in fish sauce and sweetened vinegar. Here I’ve combined many of my favorite Asian flavors with green beans and tried to balance the sweet, salty and acidity just right. This is a great picnic salad for your Labor Day cook out or a dinner side dish with rice and seared or panko-crusted tofu, or grilled meat. And once you get the hang of this dressing, you’ll want to pour it over just about everything. So here’s to the fruit we wait for all summer long, and the vegetables that keep on giving. I just came back from the Produce Auction with a gazillion pears. They’re still quite hard but already edible and very sweet. Any ideas for how I can use them? I’d like to do a little canning but am also looking for ways we can enjoy them now. Would love to find a way to freeze some for future baking as well. Funny how a few thousand miles can translate into such big differences that change the small daily patterns of our lives. We’re still sneaking blackberries off the neighbors bushes as we walk to the park and just started eating tomatoes, peppers, and corn. But if I close my eyes and imagine the beginnings of fall, here’s what I’d do. First things first, wait until they’re a little soft and smell fragrant, then slice one up and eat it over the sink with the juice running down your elbows, only make sure to do it when no one else is around so you don’t have to share. 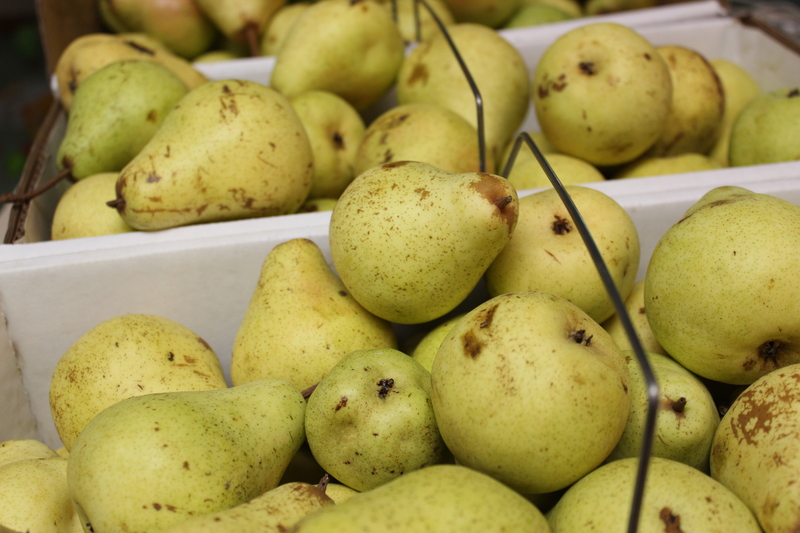 There’s nothing quite as delicious and special as a perfectly ripe pear. I always find pears start out too hard and then when you turn your back for a day suddenly they’re overripe and mushy. So if you’ve got boxes and boxes, I’m sure you can find one or two perfect ones. Barring that, here’s some other ideas. I love just poaching pears as it keeps their beautiful shape intact but ensures a perfectly soft and juicy fruit. 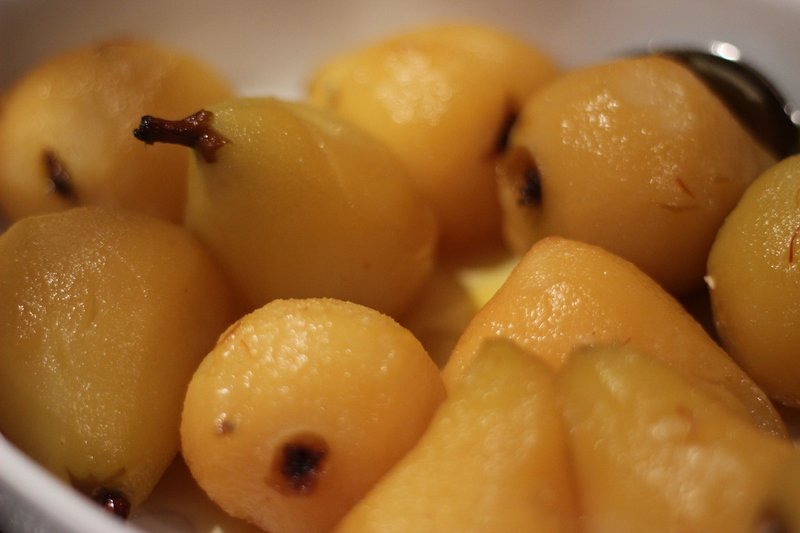 Here’s the recipe I used last time we made dinner together – it’s Ottolenghi’s Poached Saffron Pears. No pun intended, I paired them with a simple hazelnut cake and soft hand whipped cream. But I think serving these with a little square of ginger cake would be delicious too. Pear Butter is an easy way to use up several pounds of pears. Similar to apple butter the basic technique is to wash and then quarter them (no need to peel or core them if you have an ever handy food mill) then place in a large, heavy pot on the stove with some spices. I’d suggest something like 6 – 8 pounds of pears. Add a little water to the pot, a cup or so and bring to a simmer over medium high heat. Once they are soft enough to be smushed easily, grab your food mill and start spooning in ladles full of cooked pears. Food mills are a great canning tool that will push the soft parts of fruits or vegetables through a sieve while leaving the peels and other tough parts behind. It’s the kind of tool our great, great grandmothers probably used but no one’s invented anything better yet. Then grab an immersion blender and puree the cooked fruit until smooth. Here’s where the art and patience comes in. Add some lemon juice, probably a whole lemon, and then spices, I would recommend cinnamon, allspice, and nutmeg but you could always try cardamom or cloves as well. I would recommend adding about twice as much cinnamon as the other spices but start out with only a teaspoon or so at a time. Stir them in full and then taste. You want just a hint of the spice, not too much since the flavors will intensify as the butter cools. If you need more sweetness, you can add a cup or so of either honey or brown sugar. Then put the lid on the butter and simmer over low heat for as long as it takes for the mixture to thicken to an applesauce-like texture. This could be up to three hours or more. Make sure you stir the mixture every once in a while so it’s not sticking to the bottom of the pan. This gets really messy because it will bubble up and jump out of the pot whenever the lid is off, but it’s totally worth it. Once the mixture is the right consistency, put in sterilized jars and boil for 15 minutes. Then enjoy on toast or stirred into a muffin mix or into pancake batter. I’ve made a very simple but delicious apple tart that I think will translate well to pears. Take puff pastry dough (which you can find in the freezer aisle of your grocery store) and cut it in half. Then let one half warm for about 20 minutes until it’s more pliable. Slice a pear or two in thin 1/4″ slices, cored. Gently toss these in a bowl with your fingers with 1/4 cup of brown sugar and the juice of half a lemon then arrange in a thin line down the center of the puff pastry with slices overlapping. Bake in a 415 degree oven for 15 to 20 minutes until pastry is turning golden and the pears have caramelized. Oh and put down a piece of parchment on the cookie sheet. I love this Wheat Berry Breakfast Bowl with caramelized pears, wheat berries, and a sweet yogurt sauce. It’s a great fall breakfast treat. I’ve never made it, but this Ginger Upside Down Cake sounds lovely enough to try, although maybe on a colder fall day. Likewise this Vanilla Brown Butter Pear Crisp looks delicious. Pear and chocolate seem like a natural match. Make a chocolate shortbread crust and then fill with pear slices arranged in a concentric circle. Caramelize some in the bottom of a skillet with butter and brown sugar then throw into your oatmeal or put on top of pancakes, or even cook into your pancakes. Make muesli with almond milk and some grated pears. So delicious with yogurt the next morning after soaking overnight. Maybe this is the chance to try a tarte tatin. Maybe I’ll even make one using your copy of Julia Child and tell you all about it. Let me know what you do with your pears. Here is my complete generalization about British food: it’s quite excellent and extremely inspiring. I feel the need to speak in generalizations here because, in my experience, if you ask someone over the age of 50 who has not travelled to the UK since the 90’s all you’ll hear is “the food in Britain is awful!” Influenced by South Asian flavors and techniques, committed to locally produced meat and dairy, and vehement about their cultural culinary traditions, the Brits know full well how to push the global food scene in their own reserved style. In 2012 our family spent three months living in Cambridge, England from September to December. My partner had spent a full year living in Bristol many years before and we’ve made a number of trips to London, Scotland and the south coast over the years for visits with close friends. 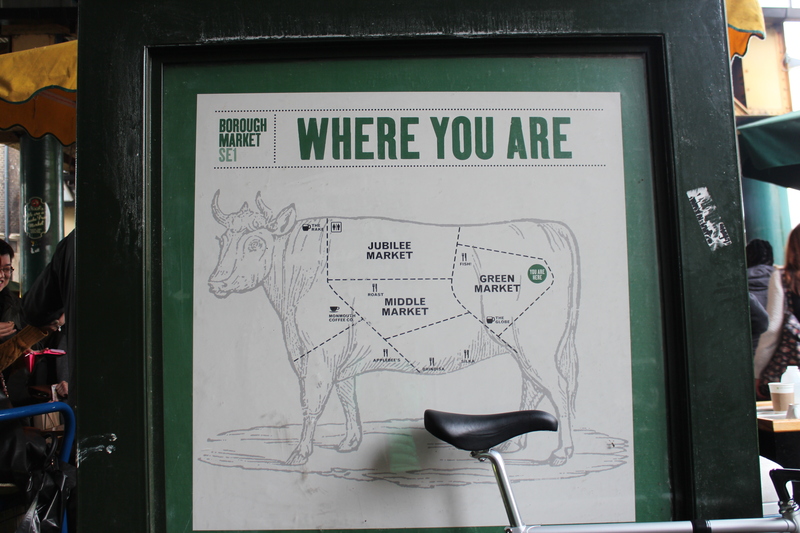 Typical of any extended stay, I was excited to really get to know British food through its markets. From Sainsbury’s to the corner take-away, I felt inspired by Britain, it’s wonderful ingredients, and strict sensibilities when it comes to taste. While roasting will be most flavorful there’s no time to preheat the oven. And there’s no way we can wait for water to boil. Use a combination of sautéeing and steaming on the stove top for the fastest cooking time. Unless we have some leftover cooked meat in the fridge, cooking meat from scratch is too difficult in small portions and once again a time issue. Vegetarian is a super option any night of the week. Just because I’m in a pinch doesn’t mean I want to carbo load my kid. I need to make something that while fast, contains protein. Adding beans is a great answer, so I always keep a few cans in the pantry. 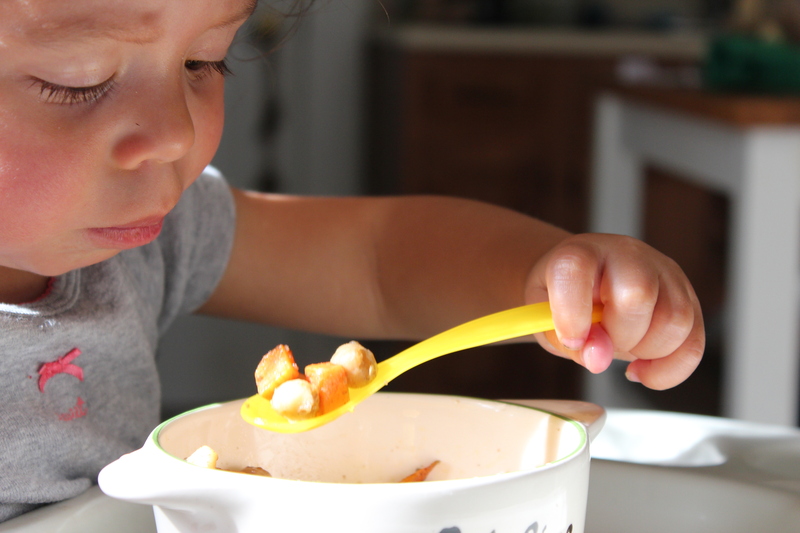 Chick peas and black beans are most popular in our house. Don’t be afraid to keep that half a carrot, a third of a sweet potato or a big slice of leftover apple in the fridge. I know in our case these little bits of food have a tendency to get lost in the corners of our fridge, but if you’re organized, these small amounts of vegetables can be used to diversify your kid’s dishes. Fast does not equal bland. 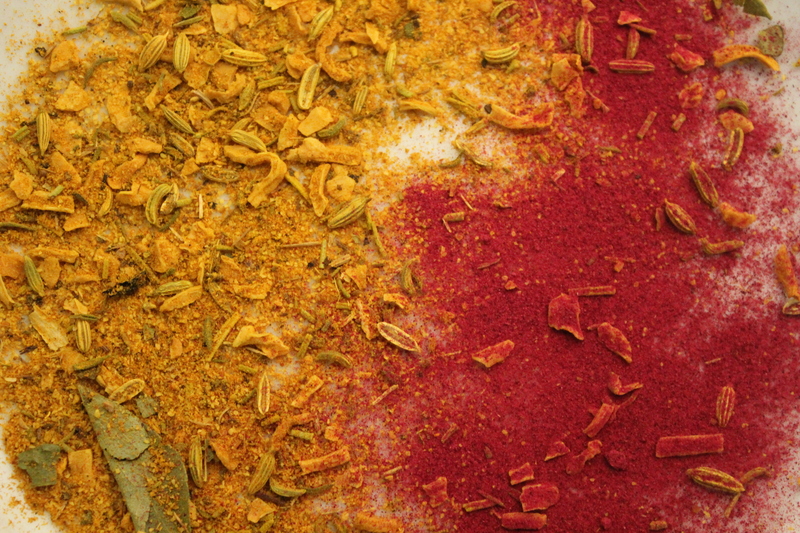 Don’t be afraid to add spices to your kid’s food. It doesn’t have to be spicy, and there are plenty of warm spices like cinnamon, allspice, and clove, as well as dried or fresh herbs, that will get your kid accustomed to more complex flavors and improve the likelihood that they will enjoy even the simplest preparations. On this particular evening, I used every one of these tips to come up with this simple dish. Have a kid clinging to your leg and don’t know what to feed her? Try these tips and let us know how it goes!